We spell our POMELOS, P-O-M-E-L-O...but even if you like to spell (or call) them Pomelos, Pommelos, Pummelos, Pompelmous, Shaddock, You Zi, Abong, Lusho fruit, or even Asian Grapefruit, you would still be correct! Which ever name you prefer, Pearson Ranch grows pomelos and ships them right to your door. Our Chandler Pomelos have a refreshingly sweet and mildly tart flavor. Their rosy pink interior, extraordinary texture and their incredible fragrance make them a delicious eating citrus fruit. Pomelos are a perfect addition to breakfast, salads, or use pomelos to create an exotic entree or desert. And now that you know where to buy pomelos, here is a little more information about them. So, exactly what are Pomelos? They are very ancient ancestors to the common grapefruit and is the largest fruit in the citrus family. They posses very little to no bitterness of common grapefruit you find in a grocery store. Pomelos are native to Southeast Asia and arrived in China around 100-200 B.C.! Today Pomelos are still a popular treat in Asian cultures, especially during Chinese New Year. 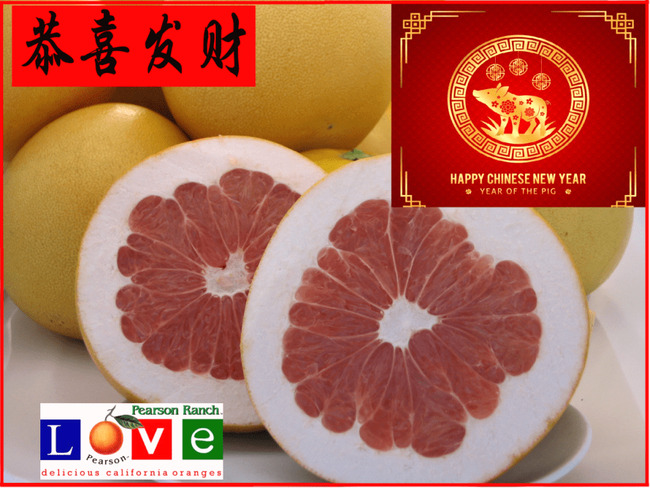 Pomelos are often enjoyed and given during the Chinese New Year as a symbol of good fortune and prosperity. Did you know? The U.S. is the largest producing country of Pomelos. That's right, The U.S. now grows more Pomelos than even China! What about the nutrition in Pomelos? Just 150 grams (about one-fourth) of a Pomelo has 60 calories and provides 130% of the recommended daily allowance of Vitamin C. It is sodium, fat and (even better) cholesterol free and is an excellent source of potassium. Are Pomelos bitter like other grapefruit? One of the many great attributes of Pomelos is that they tend to have little to none of the bitterness of other varieties of grapefruit. However, the thin membrane that envelopes the sections of the Pomelo are bitter if eaten, but are usually avoided or discarded when "sectioning" a Pomelo. Why Buy Pomelos from Pearson Ranch? Our mature pomelo trees are closely tended to by hand in order to ensure their unique flavor and fragrance. Proper amounts of well water and the right balance of nutrients with California's famous warm sunshine, help grow the absolute best pomelos...anywhere! The variety of California Pomelos we grow, end up in various sizes, so if there is specific size you need or want please call or email us and we would be happy to help you choose the size and quantity thats best for you.